Today I uncrated and configured one of the most impressive computer system setup's I've ever encoutered. The system case itself was made from 1/8" powder-coated aluminum (read : heavy metal). 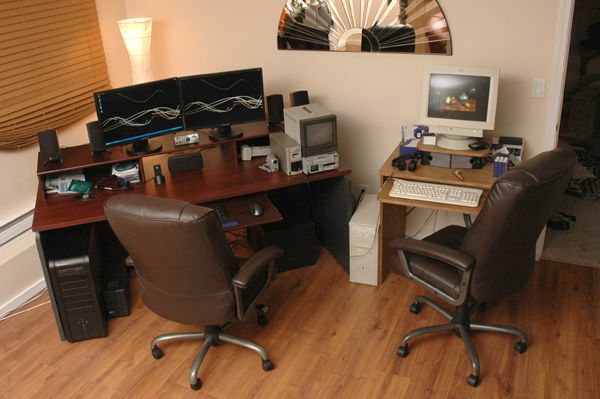 It's the new video editing workstation for DVP (left) and it's sidekick, the logging workstation. Believe it or not, I built that desk on the right from scraps in my shop last night. Take one custom cut local cedar plank, add some 20ga steel and presto! Of course, it's much more difficult than that. It's been "in production'" for a couple months now. The big hurdle was building the bending brake to make the flat, ordinary sheet steel look and a bit beefier. The bends increase the strength dramatically too. I could probably sit on that top shelf, not that I'm going to test it. The design called for a natural looking finish on both the wood and metal. 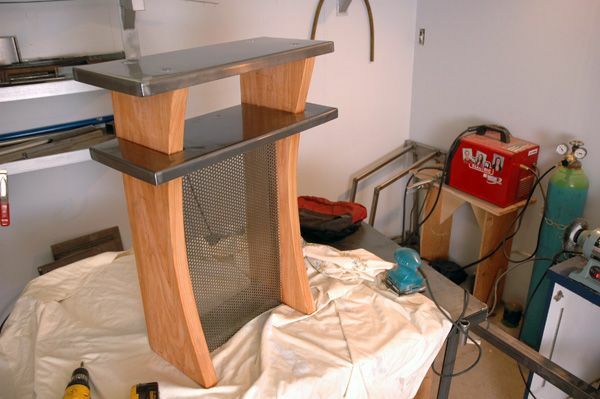 The cedar has a light stain and the metal's been sprayed with a clear coat to prohibit rust. So today was supposed to be a day of shooting video of Shane Philip for an upcoming music video being produced by Digital Village Productions (production company I'm a part of) but there were reports of 100km/h winds and some serious downpoor for this afternoon so we postponed. It would have been nice to get that filming out of the way but .... not at the cost of doing it in these conditions. Yesterday, I presented and installed the bad boy pictured here. 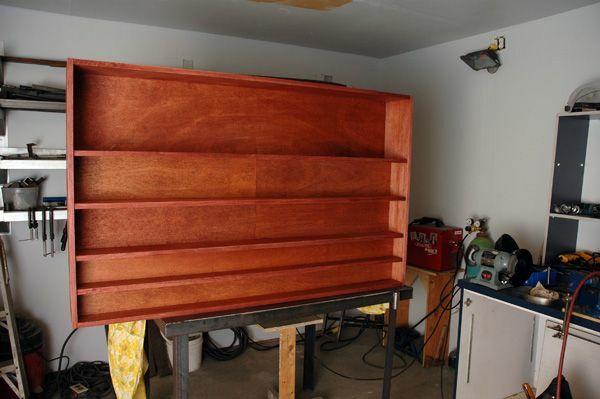 It's a 60" wide video cassette storage cabinet. It's specially designed to hold MiniDV, DVCAM, DigitalBetacam, VHS and whatever other formats you could imagine. Looks great, works awesome too. One Christmas present down, 6 more to build. Had a very interesting and busy day yesterday. Spent most of the daylight hours (that I was awake for) in Duncan filming, shooting stills and having a meeting with Cicero August, master carver from the Coast Salish nation. 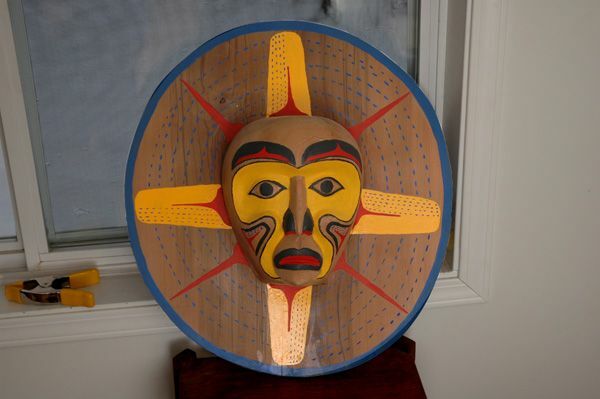 This mask is his creation, as are hundreds of masks, figures and totem poles now located around the world. Hopefully, I'll be helping him develop an online presence for himself and showcase his work on an international platform. Today on my daily walk with my dark-furred companion I decided to go check upon the contraption from two nights past. 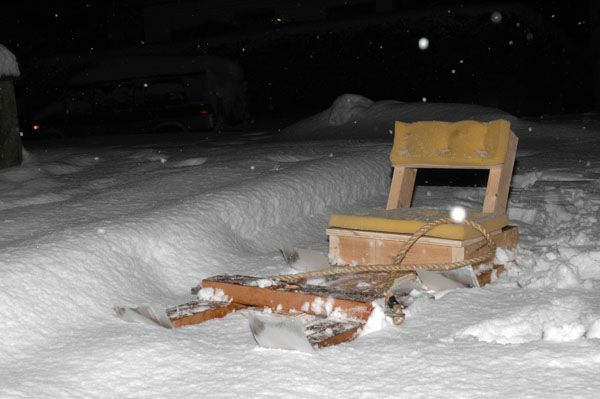 I'd left it at the bottom of a hill near my house and sure enough, it was still there. Only it wasn't just sitting at the bottom. It had become the bottom. After some not-so-careful excavation by Raya and I, it was unearthed - ready to ride again. After another half dozen runs it was eager for more so I left it to meet it's fate once again.